At this time of year – the height of summer - the thought of doing a long walk in the heat may be off putting to many people. So here is a short walk which can include a visit to the renowned Dolphin Inn. Directions: The Brickcroft is a charming amenity so it will be well worth your while to do a circuit of the south pond. Once done leave the reserve by the main entrance on Liverpool Road and cross to Hall Lane. Follow this past properties old and new for ¾ mile until you arrive at the sewage works. keep ahead to the large complex of Marsh Farm. Go through the farm to arrive on Hall Carr Lane. Turn left. Walk 150yds and then turn right over a stile by a metal gate. Cross the field to a similar arrangement close to an excessively muddy corner. From here follow the fence on the right and then cross to a wooden footbridge. and drop to a stile. Over this follow the track onto Marsh Lane and soon after reach the Dolphin pub locally nicknamed "The Flying Fish" because of its distinctive sign. Keep ahead on the lane for 400yds to reach the junction with Hall Carr Lane. Turn right. In 100yds turn left onto a footpath leading across a very flat landscape. Local legend has it that this byway is an ancient one - its straightness attributed to Roman civil engineering. It is well way marked at first with a fence on the right. and keep ahead through tall grass to reach a hedge. Keeping this too your left continue to reach a sign post at a junction of paths. Keep straight (though the right branch taking you over a footbridge will put you on Hall Lane but is far less fun.) At the time of writing (June 2016) the final section of the footpath was densely overgrown with nettle, bramble and low hanging branches. Those of you who use poles will now find these come into their own as you push a way through. A stile marks the end of this adventure. to arrive soon after at the Brickcroft. 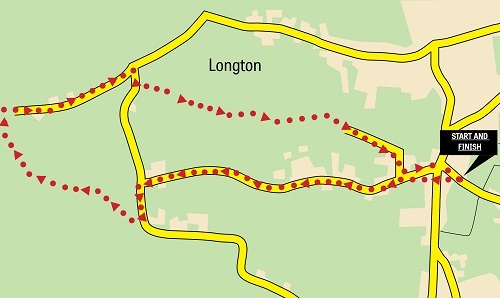 POI Longton Brickcroft is one of a number of sites around the county where industry has been supplanted by nature. Until the early 1970s clay was extracted from the area on the edge of the village of Longton. When the site was worked out it was left and within a relatively short time was colonised by plants, insects and birds. Pits became ponds; ponds that could be stocked with fish. In 1998 the Brickcroft was created a local nature reserve managed by South Ribble Borough Council. It is recognised as an important wetland site particularly valued for its swamp habitats. The Ribble Way is a long distance path following the river from the sea to its source on a 70 mile trail. It starts (or ends) at the Dolphin Inn.